The National Trust recently published a list of the 50 things a child should do before the age of 12. 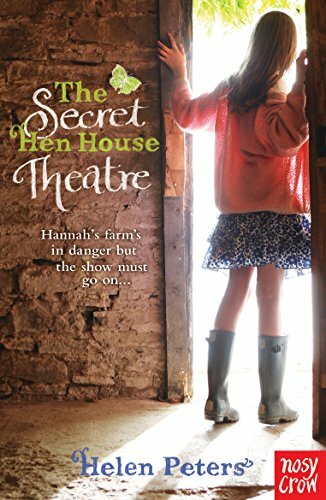 On the basis of Helen Peter’s new book, I imagine children will be adding ‘set up a theatre in an old barn and put on a play’ to that list. In the best tradition of Noel Streatfeild and Pamela Brown, Peters captures the very special thrill of devising and producing a show. With the help of her best friend Lottie, and by dragooning her siblings into taking part too, Hannah, the book’s central character, writes her own play, makes the costumes, assembles a set, and, most fun of all, turns a derelict shed on her dad’s farm into a theatre, as real as any you’d find in the West End. Tension is heightened as Hannah’s father struggles to pay the rent on the farm. It’s made worse when a piece of vandalism destroys a barn on the farm, and threatens the Hen House Theatre itself. The rural setting is vividly described and just as important in the book as the theatrical scenes. The author grew up on a farm and this is the real deal, with rusting machinery piled in yards, and lots of mud. But it is home to swallows and kingfishers too. While plot and setting give the book a very traditional feel, it has a modern sensibility: the financial threat to the farm and the family’s life feels very real; Hannah’s mother is dead and in an understated but quite moving moment, the smell of lilies reduces Hannah to tears. Above all though, it feels refreshing to read such an honest to goodness adventure story.